These were the words of an international cricketer – coming back home – who a couple of days earlier, did not know if he would ever play cricket again. The morning of April 9, 2012 saw Yuvraj Singh arrive back in India- this time, not as a world-class cricketer but as a cancer survivor. Received by his mother, Shabnam Singh, at the Indira Gandhi International Airport in New Delhi, he seemed nothing less than a champion having hit cancer for a six. Moreover, the ingenuous welcome by his devotees reflected nothing but incalculable approbation, besides the expected media frenzy. Barely does an athlete receive such a salutation back home. But then, Yuvraj was is ordinary fighter. The world, who until the recent past regarded him as a gifted cricketer, has now been given a reason to call him a fighter and a champion in the true sense of the words. Yuvraj underwent three painful chemotherapy cycles at the Boston Cancer Research Institute in the US. On a positive note he didn’t isolate anyone; in fact, he managed to keep his family, friends and fans updated with his battle by staying in touch through public forums online. He was seen regularly interacting with the world through Twitter and received an overwhelming amount of feedback from not only his Indian supporters, but cricket followers the world over. From celebrities to his little fans and from fellow athletes to Lance Armstrong – prayers and wishes for Yuvi kept pouring in like never before. And then came the big day; the day we anxiously awaited for so long. ‘Goodbye Cancer, Welcome Back Sixer’ read the banner at the Dr YSR Reddy ACA-VDCA Stadium on September 8, 2012, the day 27000 spectators gathered just to see Yuvraj Singh swing his bat once again. Amidst depressing weather, it was Yuvraj’s bright smile that stole the limelight, as India took on New Zealand in their first T20 internationals. The game however was abandoned as heavy rain took over Visakhapatnam. Nevertheless, September 11, 2012 was the day Yuvraj Singh stepped onto the cricket field after 10 months. It was the day the stadium was filled once again with avid fans roaring ‘YUVI’ in support of him all across the arena; the day jersey number 12 shone as bright as the sun again. I need not remind you just how many proud moments this southpaw has given his nation. However, this phase of his life shall be looked upon as a beam of inspiration, not only for the sporting world, but for the many people who are combating this disease everyday of their lives. Having beaten cancer in a short but fierce battle, Yuvraj Singh now wants to help others fight the disease. To support his cause, he launched a charity called ‘YouWeCan’ that will set up detection centres across India and hold awareness campaigns. Being a Yuvraj Singh devotee from the start, I had never imagined seeing myself sit down and pen his struggle and survival through cancer, but it was his strength and determination that gave me the courage to write today. I wanted to preach his story, in my word, and let people drive as much inspiration as I did from his battle. I wanted people to see that survivors are strong and I wanted people to draw encouragement and motivation from Yuvraj Singh’s story. He showed the world how strong and determined a person can be and today, I dedicate this post as a tribute to his fight against cancer. I dedicate this post to Yuvraj Singh’s strength and to all those who can draw inspiration from his struggle; just as I did. Yuvraj will soon be seen telling his story in his own words in a three-part series called “Zindagi Abhi Baaki Hai” to be aired on national television. But at the end, what we need to remember is not the fact that it was Yuvraj Singh’s fight against cancer- it was the struggle of a mere mortal against a life threatening disease. This post was to show people that Yuvraj Singh went through same thing and survived- it’s for all those who at some point in their lives did not know how long they were going to live for. This goes out to everyone who thinks he lived a hopeless hard-shelled life. No success comes without a struggle- Yuvraj’s story just goes to prove that. You can either let your hardship kill you, or turn you into a stronger person. I would definitely choose the latter. Gearing up for the ICC Champions Trophy: Are we prepared? Who says women can't play cricket? Mohammad Aamir, we want you back! Good article. Never been a fan of Yuvraj but coming back from cancer and playing for the national side shows his character. Well done to him & I wish him all the best. Inspite Of Being A Pakistani , You Writing for Yuvraj Really Shows Your Loves Towards Him. And THIS IS SOME REALLY GOOD STUFF.And The Way You’ve Handled This Article Is Perfect.And Theres Definitly A Spark In The Way You Write Which Forces The Reader To Read It Till The Last Word. Something I Always Knew Was That You’re An Amazing Debator , But You’re An Amazing Writer As Well , I Must Say. You said it. The upbringing, the values, the vision of the younger generation of Pakistani writers shine in their articles. I must emphasise here, that even among the older lot there are many such writers. But the younger lot is less constrained by the baggage of history. tj and other who have questioned Nandita’s tribute to the author – Guys, its not a zero-some game. There is so much hatred towards each others and it is reflected even in comments here. For the author to rise above all this and write a piece like this about a hero of the “enemy” country says a lot about his upbringing and values. Thankyou so much everybody. I totally respect all the above opinions. At the end, its not about being a Pakistani or an Indian, but about being a human first. And the prime reason why i picked up my pen and sat down to write this article was because his story inspired me and i believe it would motivate all those who think they’re living a tough life or going through a dark phase. However it is deeply saddening to see how some people feel no shame in bringing up topics like ‘nationality’ and ‘religion’ into this concept. @Author: Great post. Resonates with me even more because my Mom is a cancer survivor. @Deb;India: I share your optimism. You’re not at all cynical. Roha ur writing was quite strong to get me into picking up a pen as well.. I was not quite a follower of Yuvi till the last world cup Chennai match, when his kiss blown at d audience caught me head on n I am head over heels since then;-)..but then when the news of the rare type of cancer story hit the headlines, I was absolutely broken..it was a weak helpless n scary feeling, n it drained me off when I visualized him reeling in pain. Cud one believe to see a man of his stature n spirit to be struck by destiny sooo hard?.. I cant hide d fact that d worst fear did surface in my mind making me a wreck..How much ever you try to cut loose from destiny, fate holds on to you, n I could see that fear being painfully reinforced again.. But then the prince with his indomitable strength n his equally spirited mother fought the battle n emerged a winner..to the joy and relief of the nation..morning looked brighter, heart felt lighter n life seemed to be rocking again..
A man with whom millions are connected, here n abroad, unawares did a favour to many. He showed belief in oneself, love for his family n indebtedness to all who prayed for him can help one sail through hardest of situations..It is no more fantasy that we often see in films, prayers n tears n wishes bringing a man back from the clutch of the inevitable! 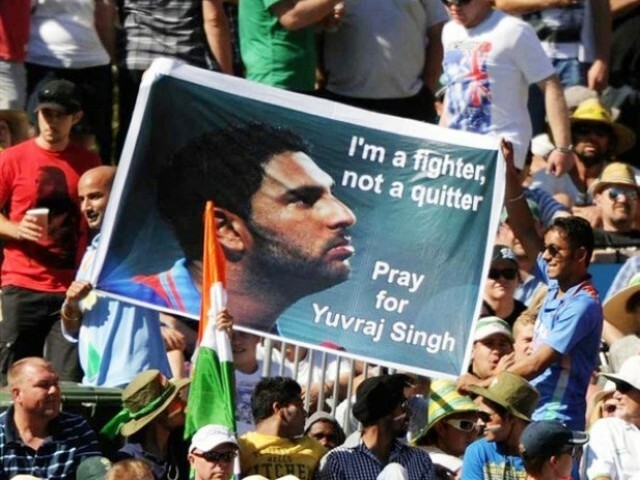 Very impressive Yuvi: Of course you are real fighter. You’re a really good writer, Roha! P.S I never appreciated his struggle the way I do atm, and it’s because of your article.